Day three of The Festival, Thursday, March 18, features two Grade One championship races - the £260,000 Ladbrokes World Hurdle (3.20pm) and the £250,000 Ryanair Chase (2.40pm) - and enthralling contests are in prospect following today’s six-day confirmation stage. Big Buck’s was a very impressive scorer in the 2009 Ladbrokes World Hurdle and he heads the 16 confirmations for the three-mile event this time around. Trained by Paul Nicholls, the seven-year-old has won on his two outings this season, both at Newbury, and is sure to be a short price to claim a second success in the contest. Howard Johnson saddled the great Inglis Drever to a record three victories in the Grade One Ladbrokes World Hurdle and the County Durham trainer hopes that the enigmatic Tidal Bay can emulate his illustrious former stable mate with victory in the three-mile hurdling championship at Cheltenham on Thursday. Tidal Bay is acquainted with Festival glory, having triumphed in the 2008 Grade One The Irish Independent Arkle Novices’ Chase. The nine-year-old, a high-class novice hurdler in his younger days, looked destined for the top over fences but problems with his jumping prompted Johnson into a rethink earlier this year. 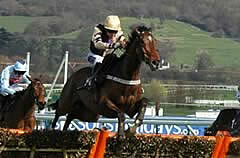 After a below par effort in the Peterborough Chase at Huntingdon in December, Tidal Bay reverted to the smaller obstacles in the Grade Two Betfair Cleeve Hurdle over the course and distance on Festival Trials Day, January 30, and landed the spoils by five lengths from Time For Rupert with Katchit back in third. Johnson revealed today: “I had been thinking about putting Tidal Bay back over hurdles because he wasn’t having a cut at his jumps. He was just backing off a bit. 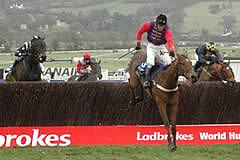 “I was pleased with the way he won the Betfair Cleeve Hurdle, he has a good record round Cheltenham. He’s in good order and as long as they don’t put too much water on and the ground is good, he’ll be fine. Other possible starters include last year’s third Powerstation, one of seven possible runners from Ireland that also includes the 2006 totesport Cheltenham Gold Cup hero War Of Attrition, who has scored in Grade Two company over hurdles on his last two outings. A total of 18 horses have stood their ground in the Ryanair Chase, with half of those trained in Ireland. Among the Irish-trained contingent is Tranquil Sea, who registered a major victory at Cheltenham earlier this season when winning the Grade Three Paddy Power Gold Cup at The Open in November. The current market leader in the Ryanair Chase is Poquelin, from the stable of champion trainer Paul Nicholls and runner-up to Tranquil Sea in the Paddy Power Gold Cup when conceding 2lb to that rival. The seven-year-old subsequently landed the Grade Three Boylesports.com Gold Cup over the course and distance on December 12, his most recent appearance. The Queen went close to enjoying a winner at The Festival when Barbers Shop was runner-up in the Jewson Novices’ Handicap Chase two years ago and the same horse is set to carry the Royal silks in the Ryanair Chase, having finished third behind the mighty Kauto Star on his latest appearance in the King George VI Chase at Kempton on Boxing Day. Barbers Shop’s trainer Nicky Henderson could also be represented by Petit Robin, third in last season’s Seasons Holidays Queen Mother Champion Chase, and Jack The Giant, a high-class performer at his best but not seen out since winning at Ascot in November, 2008. Voy Por Ustedes is a regular at The Festival, having taken The Irish Independent Arkle Trophy in 2006 and the Seasons Holidays Queen Mother Champion Chase the following season. Last year, he was the two-length runner-up to Imperial Commander in the Ryanair Chase and could attempt to go one better this year, while Schindlers Hunt, third 12 months ago, is another possible starter. Day three of The Festival kicks off with the £80,000 Listed Jewson Novices’ Handicap Chase (1.30pm) for which there are 62 acceptors, followed by the £75,000 Listed Pertemps Final Handicap Hurdle (2.05pm), where the 66 acceptors include last year’s victor Kayf Aramis. Also on Thursday’s six-race card are the £80,000 Grade Three Byrne Group Plate Handicap Chase (4.00pm, 54 confirmations) and the £55,000 Fulke Walwyn Kim Muir Challenge Handicap Chase, for amateur riders, which has attracted 64 acceptors. Thursday, March 18, concludes with the Festival Ladies Charity Sweepstake in aid of Cancer Research UK. The flat race, run over one mile and five furlongs, takes place at 5.15pm.